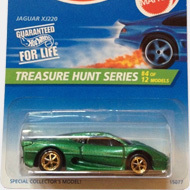 5/12 from the 1996 Treasure Hunt series. The Caddy features red paint with a silver stripe and “ELDORADO” on the sides. 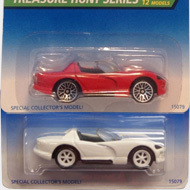 it has clear windows, a tan interior, white line Real Rider wheels, and a chrome plastic Malaysia base. 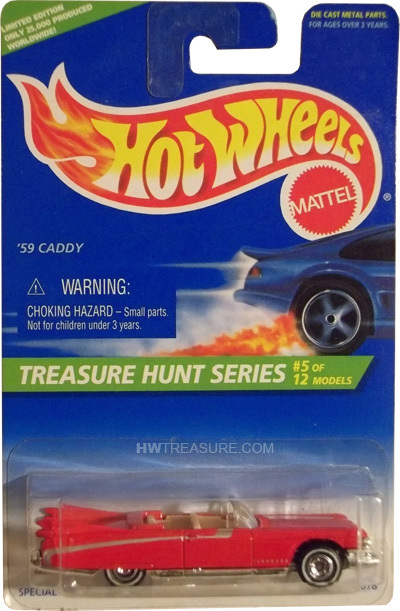 The Caddy was first appeared in the 1991 Hot Wheels series and the California Customs series. It is based upon the 1959 Cadillac which is known for its big tailfins and bullet tail lights.